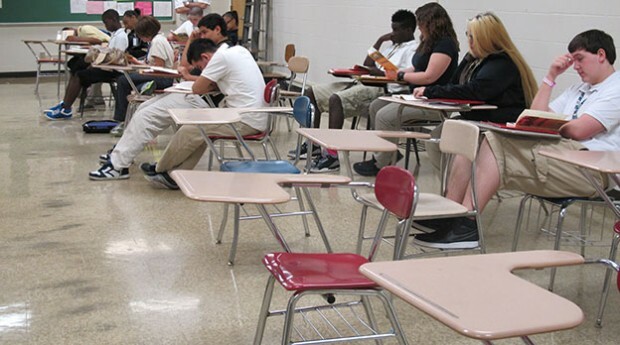 A few desks sit empty in a classroom on one of the last days of school at T.C. Howe High School in Indianapolis in June. “What do you think the number one problem has been in terms of high school in this building for us to be successful?” Indianapolis teacher Kevin Sandorf asked during an interview with StateImpact last month. A salient question — Sandorf taught ninth grade English at T.C. Howe High School, one of the five Indiana schools tapped for state takeover in the upcoming school year. A report released Wednesday shows just how right Sandorf is, demonstrating how students who are chronically absent — even middle-level grades — greatly reduce their likelihood of graduating from high school. IU’s Center for Evaluation and Education Policy conducted the study at the urging of The Indiana Partnerships Center. The report calls on policymakers to make more reliable data available so schools can intervene with students who aren’t showing up to classes. The study highlights how chronic absenteeism can be an indicator of trouble, even in the early grades. According to CEEP’s analysis, barely one-quarter of students in Grades 6-8 who missed 18 days of school or more per year went on to graduate from high school.